Commissioner Phil Hogan, accompanied by leaders of European agricultural organisations, was on a high-level mission to Iran from 11 to 13 November in order to promote EU agricultural products and co-operation with Iran. Also involved in the mission, FNPSMS (French inter-branch federation of maize and sorghum seeds) – represented by its Director Thierry Gokelaere – signed the co-operation agreement with the representatives of the Iranian Ministry of Agriculture, with the aim of promoting sorghum and its hybrid genetics. To this end, various actions ranging from training to communication, outreach and technical activities will be implemented under a three-year programme starting in 2018 with the financial support of the European Commission. 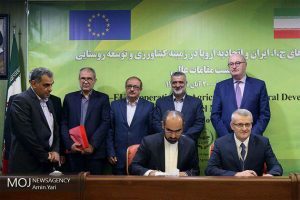 The co-operation agreement between FNPSMS and the Iranian Ministry of Agriculture, represented by Thierry Gokelaere and Javad Kolahan respectively, was signed in the presence of Mr Hojjati, Iranian Agriculture Minister, and Phil Hogan, EU Agriculture Commissioner.